Dilly beans, dilly beans, and more dilly beans! They are a household favorite and there is not a year that goes by when we don’t make a batch or two…okay, more like 20 – 30 jars. 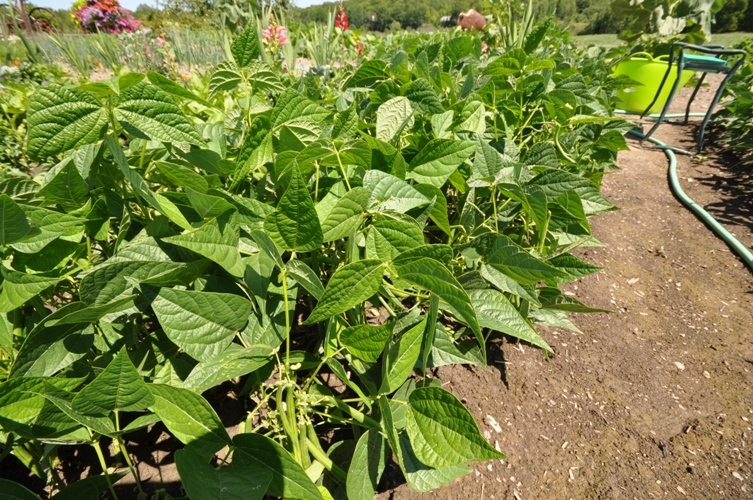 This time of year there are always more beans growing then you can possibly eat fresh and the more you pick them, the more they continue to bloom and grow again. Pickling them is an excellent way to preserve the beans for later and they really do make a tasty snack served as a side, an appetizer, or in a caesar. 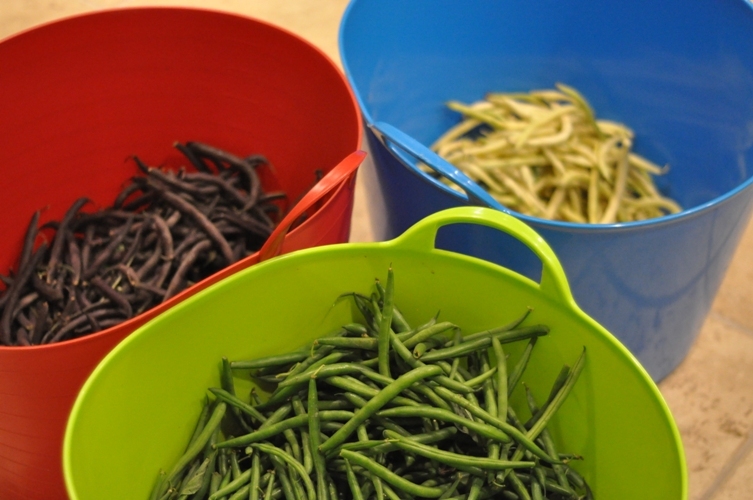 There are lots of different recipes floating out there for making dilly beans and we recommend trying a few of them until you find your favorite. 4 1/2 pounds of green and yellow beans, washed, trimmed, and cut into jar length pieces. Note: we use what is available but we like to mix the green and yellow in each jar. 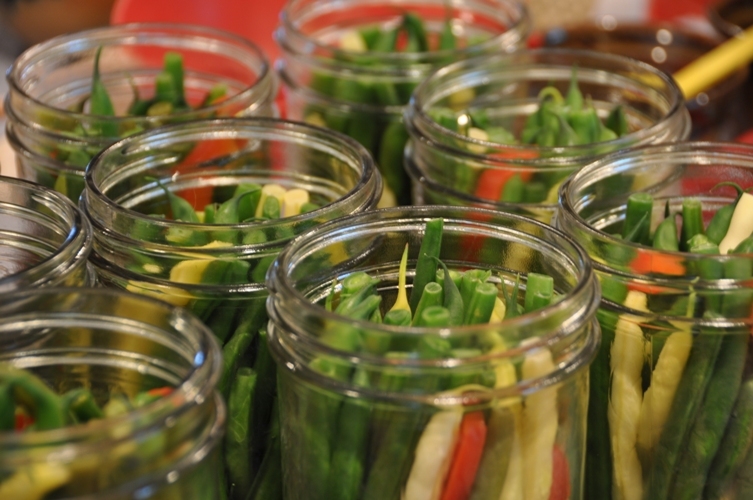 We also find it easier to pack beans into wide mouth jars…you can get more in! Prepare for water bath canning. Place 6-7 x 500mL jars in the oven at 250F to sterilize. 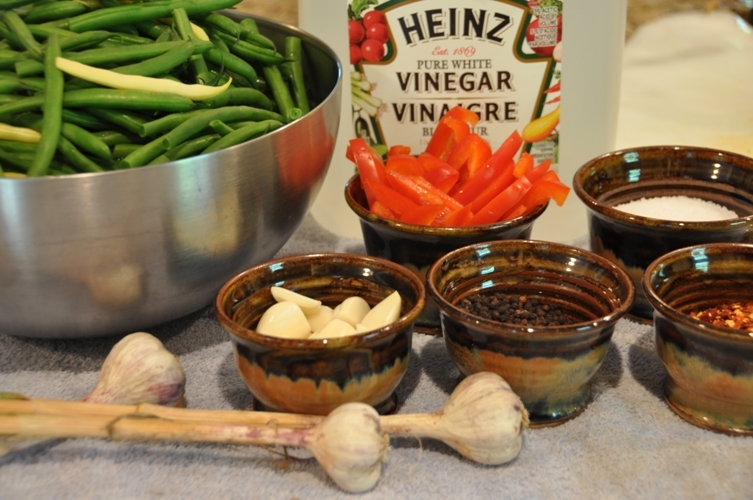 In a large stainless steel saucepan, combine vinegar, water, and salt. bring to a boil over medium-high heat, stirring to dissolve the salt. Place beans and red peppers into the boiling brine and bring back to a boil (approximately 3 minutes). Using a skimmer remove beans from brine and place in a separate boil. Working quickly add to each sterilized jar 3-4 sprigs of fresh dill (or 1/2 tsp dill seed), 1-2 garlic cloves, 1/4 tsp black peppercorns, and 1/8 tsp red chili flakes (optional). Tightly pack beans and pepper into each jar to within 1/2″ of the top. Ladle boiling brine into each jar covering the beans and leaving 1/2″ headspace. Remove air bubbles and add more brine if necessary. Wipe rims with a damp paper towel, add lids and screwbands adjusting until they are finger tip tight. Process for 10 minutes in a boiling hot water bath. When time is up remove the lid and let jars stand in hot water bath for 5 minutes before removing. Remove jars from canner, let cool, check seals, label, and store in a cool place. Best served after a few months.